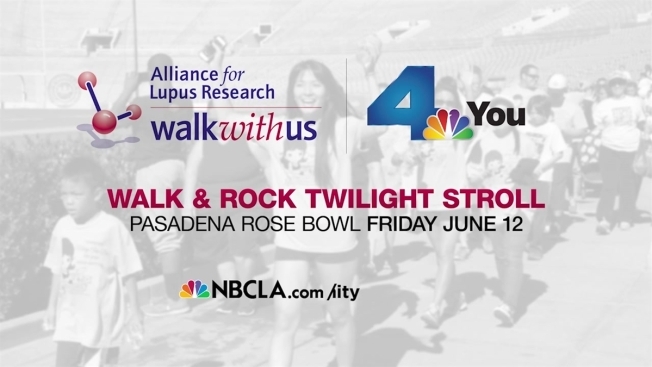 NBC4 Reporter Kathy Vara was emcee at the Alliance for Lupus Research (ALR) Walk with Us to Cure Lupus Walk & Rock Twilight Stroll on June 12, 2015 at the Rose Bowl in Pasadena. Kathy greeted participants at the NBC4 booth and Today in LA truck. There were also food trucks and kids activities for approximately one thousand participants who attended. Lupus is an autoimmune disease that causes chronic and overwhelming fatigue, and pain along with sensitivity to the sun for many. It can also affect the heart, kidney, skin, lungs, and brain. At least 1.5 million Americans are diagnosed with lupus – making lupus more common than leukemia, cerebral palsy, multiple sclerosis, and cystic fibrosis. Symptoms are unpredictable and are often misdiagnosed causing lupus to be difficult to diagnose and treat. Although, there are many men, women and children living with lupus, 90 percent of those diagnosed are women, according to ALR. Lupus is three times more common in African-American women, with one in every 250 African Americans affected by the disease. Women of Hispanic, Asian, Pacific Islander and Native American descent are also particularly vulnerable and often have more severe symptoms. More than 36 percent of lupus deaths occur between the ages of 15 and 44. To learn morel, visit www.lupuswalkLA.org.